At Da Don’s Verdict, I like to be able to not just mention about football. I follow every sport and I have a lot of different sports takes. With that being said we have quite a magnificent streak going on in the NHL with the Chicago Blackhawks. We know the Blackhawks won the Stanley Cup in 2010 with a young group that took years to build with the likes of Seabrook, Kane, Toews, and then the opportune time for Anti Niemi to step up big in the playoffs that year. I watched their game vs. Colorado on Wednesday night and I was thinking of how hard to win consistently in the NHL. They were at 21-0-3 before their first defeat in the rematch they had Friday Night with the Avalanche (COL 6- CHI 2). It’s just at the halfway point into the lockout shortened season and Chicago has a huge lead above everybody in the NHL for the President’s Trophy. 4 points tonight with a 1 goal and 3 assists for the young star including a beautiful pass to Paul Stastny for PP Goal. His impact in the two games was the reason they won; he jumped off the screen for me beat icing calls by outhustling Duncan Keith on multiple occasions. The center ice was the dominant force for the Avalanche offensively, his three assists were due his grit and toughness, similar to what I see in Boston with David Krejci, not making any comparisons but Duchene was the First Star. 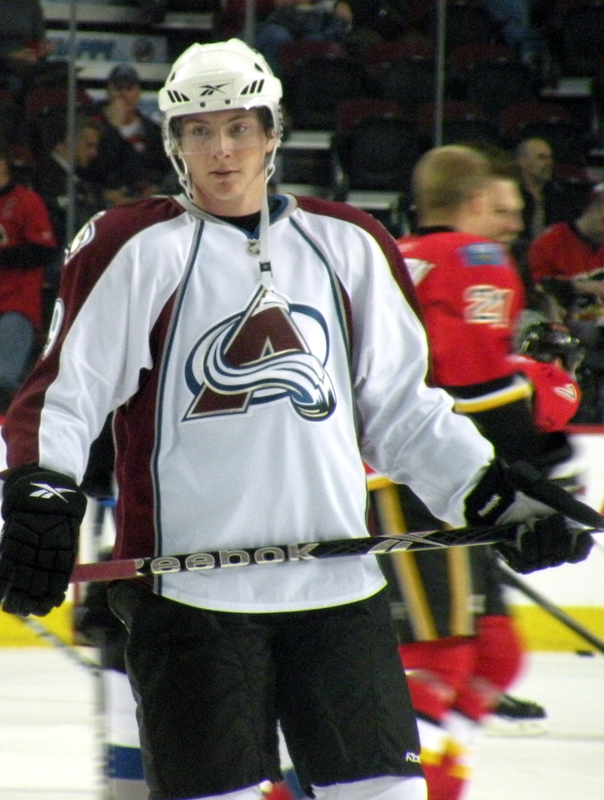 He isn’t quite on the level of Joe Sakic or Peter Forsberg quite yet but I know the organization thinks he can be. This guy is on the way to being a MEGA-STAR. 2.) The Blackhawks are Vulnerable When They’ve Played Physical Teams. The impact that D Eric Johnson had tonight coming back from injury and Ryan O’Reilly ending his holdout really rubbed off on the young Avalanche team. We also saw this against Detroit and some of their closest games this season. They usually set the tempo and the pace, Seabrook and Keith usually can win the game if they’re in control by scoring first. They did that tonight but they got out-hustled. I didn’t hear much of Hossa in this game, and other than Kane and Toews no one really played well. 3.) The Avalanche scored four goals on 9 shots in the 2nd Period! 4/9 on shots I’m not joking logging this game was just weird. Even more weird was that Chicago outshot Colorado. Their Penalty Kill really let them down (2-4 PP), but overall that second period was everything that they weren’t this season. I already mentioned Duchene, but John Mitchell and once again Ryan O’Reilly both scored in the period the benefit of PA Parenteau’s veteran presence. They worked hard for them by taking advantages of their chances. 4.) The Blackhawks Offense Thrives Off of the Cycle and Utilizing the Point; Take those Away and They Have No Structure in the Offensive Zone. Self-Explanatory, this is the analysis I got from my friend Nolan Blakeley on the game, I will mention later on what impact their defensemen have at the point offensively, Keith got beat in the footraces and Seabrook had little physical presence. They had chances but not many quality chances. Toews and company WILL NOT let this happen again. Hjalmarsson was a -1 tonight very unlike him, usually always in the right spot. Seabrook has ability to score at the point but couldn’t find a lane and Kane couldn’t cash in either at the wing. After the 6-2 and fans cheering their defeat its to reflect on the 30 game streak overall. Let’s look more in depth and what was accomplished in there last thirty games. To start the season many included myself probably viewed the Chicago Blackhawks as one of the best teams in the NHL, along with the New York Rangers, and defending Stanley Cup Champion Los Angeles Kings. But nobody could legitimately predict a 21-0-3 start to a season where they (or anyone else) hadnt had a training camp. They’ve beaten some really good teams this season including the reigning Stanley Cup Champion Kings (5-2) in the season opener, two wins vs. the St. Louis Blues, Red Wings, and the Vancouver Canucks (2011 Western Conference Champs). The NHL has plenty of young stars as you saw one of them tonight, Duchene and the Blackhawks will face with two other potential stars in Taylor Hall and Ryan Nugent-Hopkins for the up and coming Edmonton Oilers so they could very well be on another streak now that we’ve seen Hossa as a no-show tonight and the shoulder injury to Patrick Sharp. The Chicago Blackhawks are ranked #4 in team -scoring, the NHL averaging (3.12 Goals Per Game) Patrick Kane leads the team in points with 27, also leads the team in goals and assists (12G,15G). Look at their top-end talent. Yeah they have Patrick Kane but they also have C Jonathan Toews, RW Marian Hossa, Patrick Sharp (injured), and youngsters Andrew Shaw and Brandon Saad who have contributed. Only 8 teams in the NHL average over 3 goals a game (Washington, Pittsburgh, Philadelphia, Carolina, Toronto, Montreal, Anaheim, and Tampa Bay). But their Power Play is 13th in the NHL (17.8%). Remember that the last two Stanley Cup Champions (LA Kings and Boston Bruins) had awful Power Play offense, but 13th isn’t bad it’s top half in the league. 4th in S/G (Shots per Game) at 30.8. Head Coach Joel Quenneville and his team had major questions about Goaltending heading into the season after losing to the Phoenix Coyotes in the first round of the playoffs last season. But Corey Crawford is playing like a more than worthy candidate for the Vezna trophy. But don’t discount the impact of backup G Ray Emery who hasn’t been defeated in any fashion this season (10-0-0). So Goaltending has been the Key, and you saw tonight with Crawford off his game that the offense can’t always pick him up like Crawford and Emery were able to pick up the offense at times during the streak. To further prove that the Blackhawks defense and goaltending have been beyond amazing, they’re at a league-best scoring defense (1.8 GA/Game). They also have the #2 Penalty Kill in the NHL (87.1%) after tonight’s game Colorado went (2-4 PP). Although tonight vs. the Avalanche they let up 6 goals, I would imagine that this is a rarity, plus Duchene as I stated earlier hurt them. They have great talent on defense, Brent Seabrook, Duncan Keith, and Niklas Hjalmarsson who each have played every game this season (24 games). Hjalmarsson has been sound this season, the Swede has a (+/-) 9, but when it comes to Chicago defensively you notice the physicality of Brent Seabrook and how seldom he spends time in the Penalty Box. Duncan Keith has 11 assists this season, pretty good option for them offensively. The Chicago Blackhawks are the best team in the NHL, that’s solidified. What I noticed while looking their schedule and their streak was how close a lot of these games were. Let’s look beyond the numbers. Most Games without a Loss in regulation is 35 games by the 1979-80 Philadelphia Flyers at 35 games the Blackhawks ended at 30 games (dating back to last season). Let’s put this in perspective, 16 games out their 24 (2/3 of their games) have been decided by one goal or less. In 10 OT games they’re winning 70% of them. Daniel Carrillo’s GW Goal vs. the Avalanche, Patrick Kane’s SO goal vs. the Red Wings further shows the resiliency that Chicago has. You don’t need Barry Melrose or Pierre McGuire to tell you how this will impact the way it affects them in the postseason, many teams have been great in the regular season then one injury or a series of bad games just leaves a ripple effect that they never recover from. Every year has a signature story in each sport, heck we seen it in the MLB with Buster Posey’s comeback from injury to lead the San Francisco Giants to a second World Series title in four years, and watching Ray Lewis end his career with a second ring. 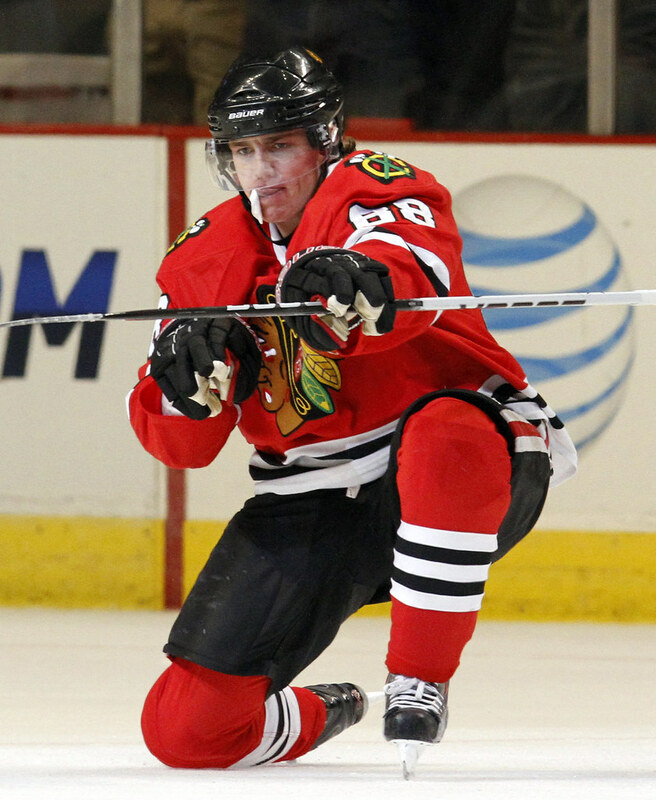 The NHL’s lead story at the halfway point of the season, the Chicago Blackhawks are the story. Even Miami Heat stars LeBron James and Dwayne Wade had no hesitation in saying how impressing the Blackhawks streak was. They’ve answered most of the questions that got them booted in the 1st round of the playoffs vs. Phoenix. Corey Crawford is my midseason pick for the Vezna Trophy (Best Goaltender in the NHL), but I also feel this team will have to stay healthy we all know about Marian Hossa and his history of getting injured, heck Patrick Sharp will miss three weeks, this team is great top to bottom but they can’t afford to lose Hossa and Sharp up front. On defense they’ve been the best and with Brent Seabrook’s highlight hits and extremely low PIM I expect him to continue to impress. This team will no doubt be in the #1 seed in the Western Conference barring a collapse unseen in the NHL before. The other twenty-nine teams in the NHL will be chasing them; I don’t think there are many teams who could beat them in a seven game series. I feel the Anaheim Ducks, Los Angles Kings, Boston Bruins, and Pittsburgh Penguins are the only teams who can keep them from the cup. With the streak’s end the Edmonton Oilers have to chance to start a different streak for the Blackhawks but as I’ve tweeted before I like Jordan Eberle and Ryan Nugent-Hopkins with Ales Hemsky, very similar to the Avs. Blackhawk fans don’t need to worry you’re still the favorites for the Cup for now.